If you’re looking for a way to create more engaging and effective classroom presentations and maybe save some time while doing so, this article is for you. 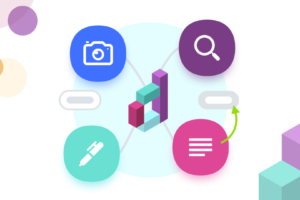 In this quick guide we’ll show you how to use MindMeister as a powerful alternative to classic and often convoluted options such as PowerPoint or Prezi. MindMeister uses the mind map principle to help students comprehend and retain information better and offers numerous practical ways of utilizing and repurposing content both during and after the presentation. What Is a Mind Map Presentation? A mind map is a diagram that uses keywords, colors, images and other graphical elements to represent information. When you create a mind map, all of its content is visualized on one single page. The map’s subject is always located right at the center of this page. All related subtopics and keywords are arranged around the center in a radiant, two-dimensional structure and connected to it via lines. A mind map presentation, then, is a dynamic slideshow that you create from such a mind map. Each slide shows a detail of the map, such as a branch or an individual topic. At the beginning, the end, and at key points during the presentation, you can zoom back out so the whole map can be displayed for the audience. How Does a Mind Map Presentation Work? In a classic Power Point presentation, students are presented with a number of independent slides, one after the other, with no way of seeing the big picture. There may be a table of contents shown on the first slide, but a list of unfamiliar keywords and headlines is all too quickly forgotten. In order to comprehend and retain individual pieces of information, students need to be able to place them in context and understand how they relate to one another. It’s the difference between merely collecting dots, and connecting them. Seeing all topics of the presentation laid out in the two-dimensional structure of a mind map helps students do exactly that. 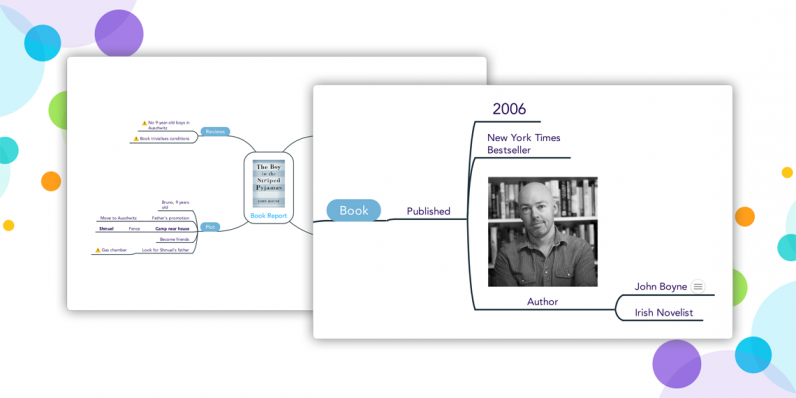 Start by creating a new, blank mind map in MindMeister. Write the subject of your presentation in the center of the map, then use the TAB and ENTER keys to create new topics. The TAB key creates sibling topics, the ENTER key creates child-topics. Tip: Use keywords or short phrases for the topics in your map. You can add additional information in the form of notes, links, comments and even attached files without cluttering up your presentation. Visuals function as memory triggers, so make sure to add lots of images, icons and colors to your map to make the presentation as memorable as possible. You can upload your own images using the sidebar on the right side of the map editor, or simply drag-and-drop images onto a topic. You can also use different font sizes to highlight individual keywords. 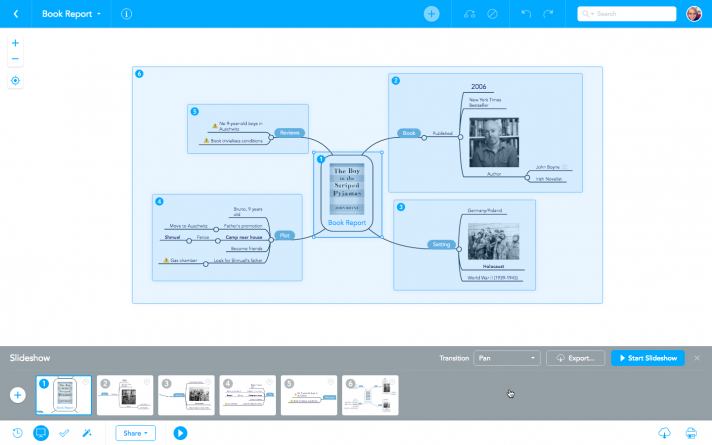 Now it’s time to turn your mind map into a presentation. In the footer of the mind map editor, click on the presentation symbol to open presentation mode. While pressing the CMD key (or CTRL key if you’re on Windows), click and drag your cursor over topics in the map to create the slides. Start with the topic in the center, then create the other slides in chronological order. Tip: Show the whole mind map at the beginning, somewhere in the middle, and once at the end of the presentation to ensure your audience knows how everything is connected and related to each other. When all your slides are created, click on the Start Slideshow button to play the presentation inside your browser. You can present to the classroom just like you normally would, by connecting a projector to your computer and projecting the slideshow onto a big screen. Alternatively, you can invite students to the map (making sure to give them read-only access) and broadcast the presentation to their screens (a great way to reach remote learners and support distance education!). 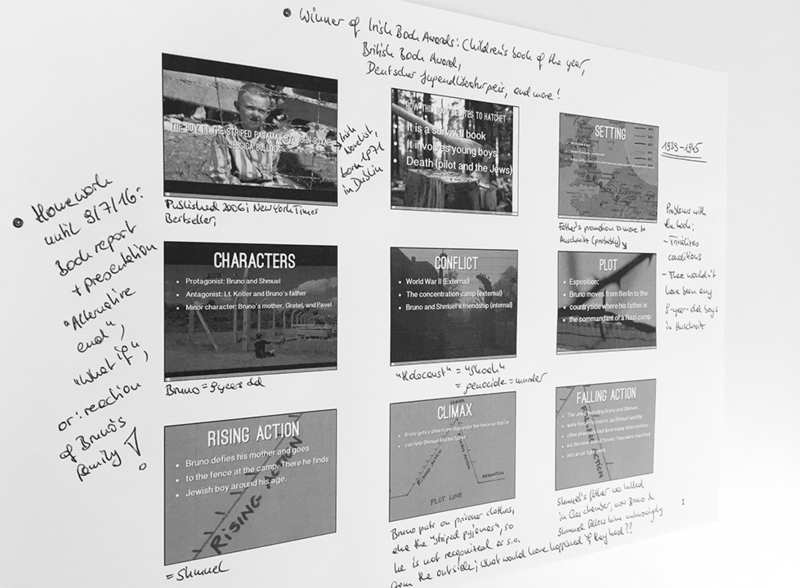 Gone are the days when students had to study from those tiny hard copies of teachers’ presentation slides – trying to fit up to 9 slides onto a single A4 sheet to save money on ink, and adding their own barely decipherable notes to the sheet. Export your mind map presentation as a .mind file and either send it to students via email or make it accessible for download in your shared cloud space. 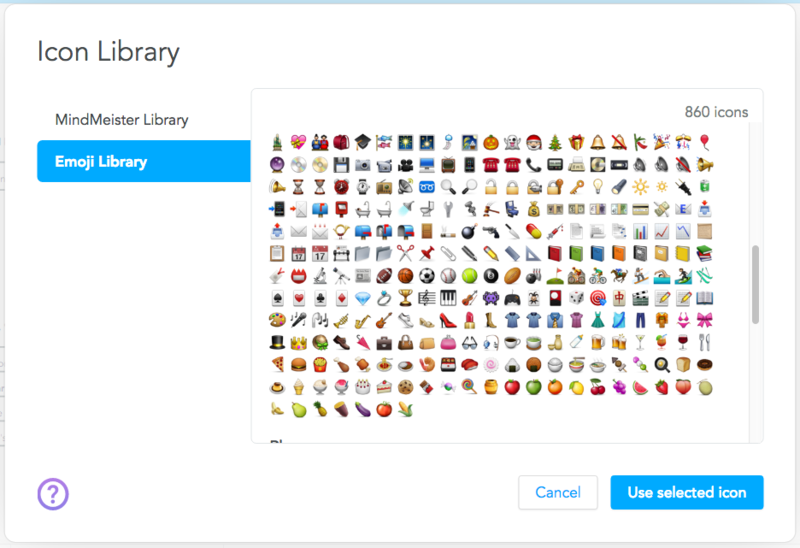 Tell students to download and import the file into their own MindMeister account. 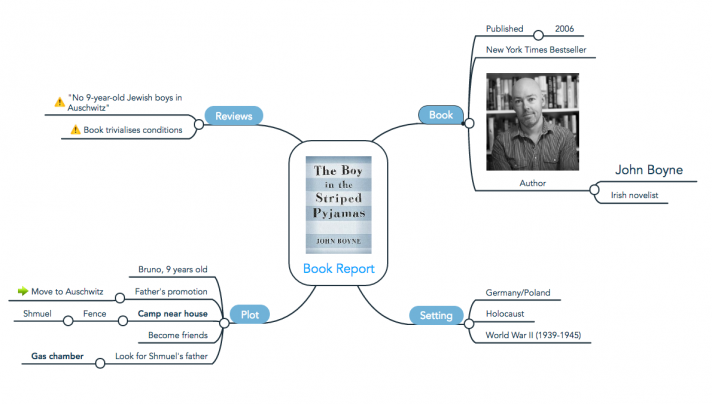 During your presentation, students can take notes directly inside the mind map, adding details to the keywords as well as emphasizing what seems important to them. This way, they don’t end up with two sources of information (namely your slides and their notes), and they don’t feel the need to copy the content of your slides alongside their own notes just to make sense of them later on. If the goal of your presentation is to spark a discussion among students, share your mind map with the whole classroom, ensuring that all students have write-access to it. 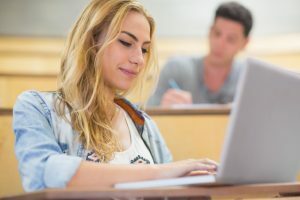 You can do this either by creating a secure link and sending it to them, or by inviting them directly via email (take a look at our guide about inviting whole groups of students at once). As soon as everyone is logged in, all students can take notes, add ideas and vote others’ ideas up or down inside the map – and all in real-time. Your browser is not able to display frames. Please visit Book Report on MindMeister. 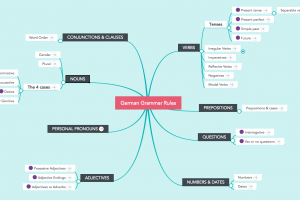 Are you ready to give mind map presentations a try? 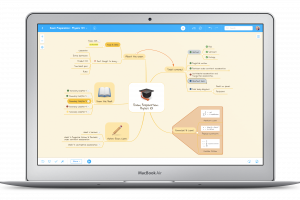 MindMeister offers great discounts for teachers and students. 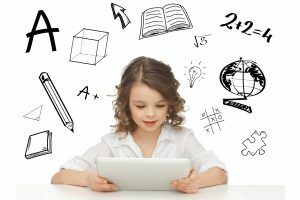 Sign up for one of our educational plans today or create up to three mind maps for free with our Basic plan.